Several weeks before Bonnie Foreman's death, I watched her laughing and joking as she downloaded a pirated copy of my book, The Copyright Permission and Libel Handbook: The Cursed Edition. She read a lot and drove too fast. I said I'd give her six weeks to live. The autopsy carried out on her body was inconclusive. But, here's what I can tell you. She expired around page 36. Somewhere between out-of-print works and special fair use situations. Curse or coincidence? I cannot say for sure. 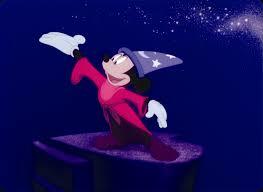 I'm a copyright attorney, not a sorcerer. What I do know, it wasn't the copyright notice that did her in. When we are confronted with a book curse, we are forced to reflect on on our mortality. 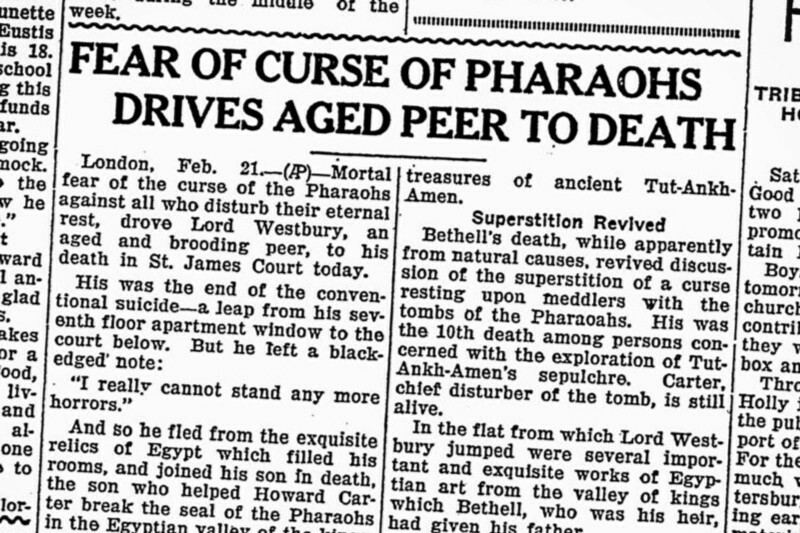 Three thousand years after his death, King Tutankhamen's curse still conjures up fear (unlike an FBI anti-piracy warning or copyright notice). 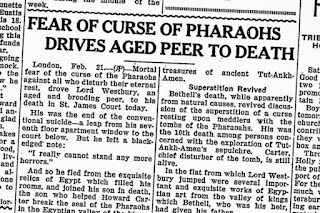 While a three thousand year old curse may retain its potency, copyrights wither and fall into the public domain a mere 70-years after the creator's death. From the standpoint of being an effective deterrent, it doesn't help that copyright notices resemble frown emoticons resting on their side. Do you wish to protect your intellectual property, but don't have the means to hire a lawyer? Gory, gruesome, nasty, cautionary, score-settling book curses were once used to stop literary thieves and plagiarists in their tracks. Unlike the copyright notice, which simply proclaims "I own this" (with reservations), curses make it abundantly clear that some profound form of adversity or misfortune will befall the person who ignores it. While there are some issues to iron out, I have come to believe that a mix of legislative solutions, works licensed under Creative Commons licenses, and cursing, offer a workable solution to an internet that wants to be free, and authors who want to eat. Old sorcerers wrote the following ancient warnings. While dormant for years, these precursors of the modern copyright notice, are a creative and cost-effective way to protect your intellectual property. In Biblioclasm, a book about the magic powers of the written word, the author identifies the following as the most famous literary curse. It still has what it takes. "Whoever alters a word of this mahzor or this writing or erases one letter or tears off a leaf . . . may he have neither pardon nor forgiveness; neither let him behold the beauty of the Lord. He shall be like a woman in impurity and like a leprous man, who has to be locked up so that his limbs may be crushed, the pride of his power broken, his flesh consumed away that it cannot be seen, and his bones that were covered made bear." The Ben-Asher curse focuses on the integrity of the text, not theft. Under copyright law, the exclusive right to alter or adapt the text resides with the author, in this case Yahweh. 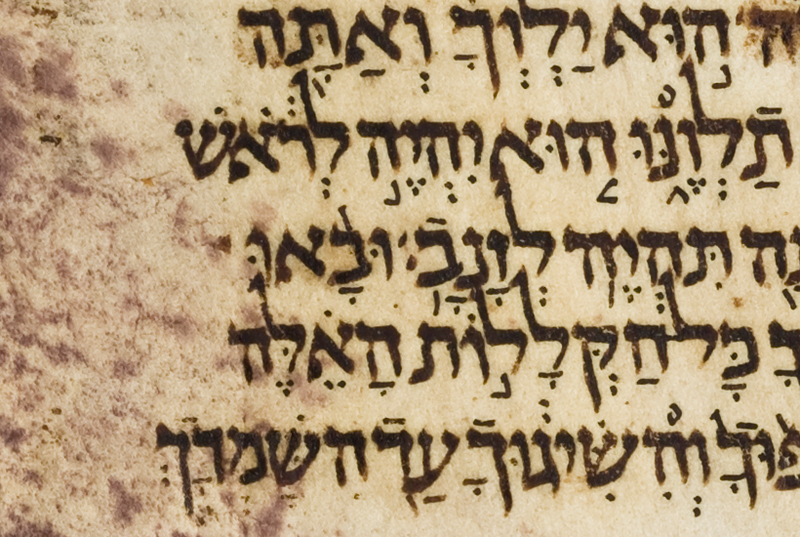 Elsewhere in the Codex, atop certain pages, it reads, “Sacred to Yahweh, not to be sold or defiled.” Personally, I think disgorgement of profits (a remedy under copyright law) better fits this type of crime than broken bones or necrotizing fasciitis. That said, the Nazi face melting scene from Raiders of the Lost Ark has my vote for the most iconic scary movie scene in cinematic history. Medieval colophons, the antecedent to the copyright notice, appeared, initially, as concluding statements at the end of a book or manuscript. The colophon gave information about the scribe or copyist, date and place of copying and contained either a blessing or a curse. To thwart piracy, printers' marks appeared at the dawn of Western typography. So, while a direct connection between the colophon (and printer's mark) and the copyright notice may appear fuzzy, the common assertion of ownership rights, and threat of consequences for those who publish "impudent frauds" cements the connection in my mind. To get the most out of a curse, or copyright notice, it must be displayed prominently. Geoffrey Galister, in the Encyclopedia of the Book (Oak Knoll/British Library), explains that by the early 16th Century, the practice of placing a colophon at the end of a book was largely abandoned. 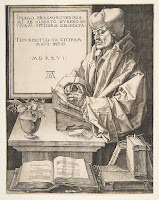 Instead of the scribe's name appearing at the back of the book, the printer's name (and its royal license to sell the work) appeared on the title page where it could be more easily seen. Makes sense. As a deterrent, copyright law provides more potent penalties against willful or knowing infringers, than innocent ones. Similarly, with a curse, knowing you've been cursed, makes the curse more potent. Although, many "sorcerers claim that curses can be just as effective without the victim’s knowledge of them." See, Mystica. Being an "Eye of newt, and toe of frog" kind of guy, I recommend prominent display of both. By the early 18th Century, secular threats of legal action largely supplanted curses. With the passage of the Statute of Anne in 1709, England's first copyright act, the regulation of unauthorized copying was transferred from god's jurisdiction to her Majesty's courts. In 1802 the U.S. Copyright Act, a direct descendant of the Statute of Anne, was amended to require a notice be placed on each copy of a work. ALL RIGHTS RESERVED. No part of this book may be reproduced in any form by any electronic or mechanical means (including photocopying, recording, or information storage and retrieval) without the prior written permission of the publisher. Not too scary. Compare the polite "All Rights Reserved" statement found in close proximity to many copyright notices, with your average illuminated manuscript curse. If you were lent a manuscript and failed to return it, or made an unauthorized copy, you (and sometimes your forebears and children) were forever cursed. In contrast, a copyright notice is a yellow blinking light at the corner of Purchase and Purloin Streets. Copyright notice or curse? No contest. "Whosoever shall carry off this tablet or shall inscribe his name on it, side by side with mine own, may Ashur and Belit overthrow him in wrath and anger, and may they destroy his name and posterity in the land." The profound fear of being forgotten loomed as large in Babylonia then as in Hollywood today. Removing the name of a king from a cuneiform tablet meant he never existed. Much the same can be said for failing to credit a writer of a screenplay, whose livelihood (and footnote in history) depends on the works which bear their name. Whether a curse or a copyright notice, these admonitions are powerful starts to the reading experience. Where does the power come from? Fear. "May whoever destroys this title, or by gift or sale or loan or exchange or theft or by any other device knowingly alienates this book from the aforesaid Christ Church, incur in this life the malediction of Jesus Christ and of the most glorious Virgin His Mother, and of Blessed Thomas, Martyr. Should however it please Christ, who is patron of Christ Church, may his soul be saved in the Day of Judgment." Before Johannes Gutenberg's invention of the printing press in the mid-1400s, books were precious objects worth fighting over. Coveted by the wealthy elite, stolen in a prior era by marauding Norsemen, literary monks went to great lengths to protect their collections of valuable manuscripts. Not only did they employ curses, but, they tethered their bibles to bookshelves and lecterns with chains. "Hold! You crafty ones, strangers to work, and pilferers of other men’s brains. Think not rashly to lay your thievish hands upon my works. Beware! Know you not that I have a grant from the most glorious Emperor Maximilian, that not one throughout the imperial dominion shall be allowed to print or sell fictitious imitations of these engravings? Listen! And bear in mind that if you do so, through spite or through covetousness, not only will your goods be confiscated, but your bodies also placed in mortal danger." A copyright notice threatens economic harm, while the strategy behind the black art of the curse is to attack the infringer's mind. 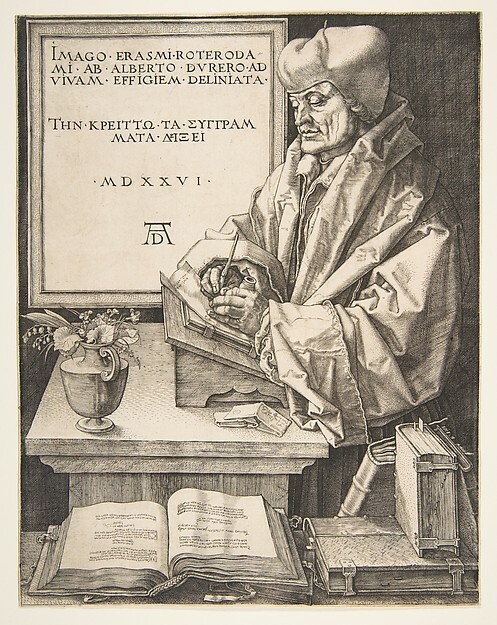 Dürer's transitional curse succeeds at both tasks. Tensions between copyright law and freedom of speech aside, curses offer an intriguing 15th Century solution to a 21st Century dilemma. Willie, the very first Mickey Mouse cartoon, passes into the pubic domain on January 1, 2024, perhaps Mickey, whose been known to dabble with spells, will don his glowing blue hat with white stars and a crescent moon again, and conjure an army of battling brooms to keep Steamboat Willie shackled. ©💀 2016 - 2018 Lloyd J. Jassin. All Rights Reserved. Disclaimer: Please note that this article is not designed to give any specific advice concerning any specific circumstances. Readers are strongly cautioned to consult an attorney before consulting a practitioner of the occult arts. Protected by the Eye of Horus. May be reproduced in whole for non-commercial purposes, provided author and website is credited. If not, may you be seized by the neck like a bird, your head cranked off, and your carcass hung up to drain*. *Adapted from a curse on the tomb of the courtier Biw at Sakkara, circa 2260 B.C. Lloyd J. Jassin is a publishing attorney, and head of his own private practice, where he concentrates on legal issues affecting authors, literary agents, publishers, and composers. He began his career in book publishing, working for companies such as Prentice Hall / Simon & Schuster and St. Martin's Press in publicity and marketing, which may explain his affinity for trademark law. His the coauthor of The Copyright Permission and Libel Handbook (John Wiley & Sons). Biblioclasm: The Mythical Origin, Magic Powers & Perishability of the Written Word (Rowman & Littlefield) by Marc Drogan.